When Democrats unveiled their Green New Deal to fight climate change, the Republican response was swift and strikingly uniform. A socialist wish list, said a spokesman for the national party. The socialist Democrats are off to a great start! exclaimed a spokesman for the GOPs congressional campaign committee. Socialism may begin with the best of intentions, but it always ends with the Gestapo, chimed in Republican Sen. Tom Cotton of Arkansas, invoking Winston Churchill. The presidents political rise has been replete with dark and scary imagery and perceived threats of his own making. Marauding street gangs. Rapists, drug dealers, murderers spilling across the countrys border with Mexico. By invoking a socialist threat, he summons - at least for those of a certain age - the whiff of Red Menace, bread lines and an assault on democracy and the countrys foundational free-enterprise system. Its the sense of something foreign, something un-American, said Stephanie Mudge, a UC Davis sociologist. The center of gravity within the Democratic Party has unarguably shifted leftward in recent years; polls show that Democrats have a much more favorable view of socialism than the rest of the electorate. Support for universal healthcare, higher hourly wages, increased taxes on billionaires and greater government oversight of the economy have all become standard orthodoxy among the partys leading White House contenders. But the consensus quickly breaks down when the question is how best to achieve those goals. 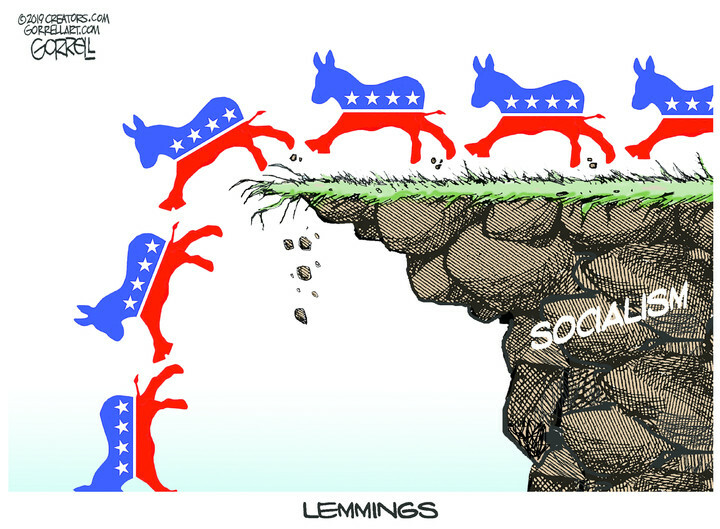 Socialism is both a political and economic philosophy that promotes big-government non-constitutional fascism, and progressive redistribution of wealth by government masterminds -- the definition of the modern democrat party. How do you fight truth... when your “mockingbird” mouthpieces are being silenced? Ban & outlaw Socialism in America . Stand up a national Civilian Volunteer Militia , whose primary mission is to root our and remove socialism from the fabric of American society . Socialists count on no one doing anything about them . Are we going to repeat that here ? Wait...until it’s too late ? At what cost do we continue to tolerate the intolerable ? PDJT is scheduled to deliver a speech next Monday at the International University of Florida in Miami. They HAVE agreed how to respond. Unfortunately most Republicans in congress agreed with them as well. I give one generation before calls for ‘land reform’ in this country. Want to read something scary? Read what Beta O'Rourke's platform. It's taken right out of Das Capital. The Democrat Party has been run by Reds for decades. Who does the LA Times think it’s kidding? And one thing that repeatedly should be tied to socialism by the Republicans . . . the dictatorial variation of it . . . is that of the Democratic Party’s ceaseless pursuit of gun control. Their intentions are evil and murderous. One man with a gun can control 100 without one. ... Make mass searches and hold executions for found arms. The Constitution was intended to ban Socialism from America before that wordws even used! The great irony here is that our $22 trillion of Federal debt is probably the best defense we have against socialism. The U.S. is like the 25 year-old moron who would piss away $200,000 on a Lamborghini ... except he's too busy paying off $200,000 of college debt to buy it. Socialism may begin with the best of intentions, but it always ends with the Gestapo..."
You can vote your way into Socialism, but you have to shoot your way out of it. Thank goodness the Socialist-Demos have rejected the path of moderation they said would be their path to the Congress and the presidency. Most of those that ran for Congress as faux moderates have signed on to the New Green Deal agenda, as have those that announced their candidacy for the Dem presidential nomination. It will create a target-rich environment for President Trump and all GOP candidates. So I say to the Socialists. let’s have more of the same! Next step — call it what it really is — use the c-word. They’ll stammer and start going into various cliche leftist talking points to avoid admitting that they’ve never actually lived under the system they’re promoting. Socialism is both a political and economic philosophy that promotes big-government non-constitutional fascism, and progressive redistribution of wealth by government masterminds — the definition of the modern democrat party.